It seemed like there was a moment when comic book superheroes were over saturating the theaters and the quality of the films were redundant and 3D headaches. The first Captain America revitalized the genre and the Avengers and Joss Whedon gave the alternative universe some credibility. This 2nd instalment of the series is by far one heck of way to start the year of big adventure movies. Directors Anthony Russo and Joe Russo balanced the script by Christopher Markus and Stephen McFeely with just enough action and angst that felt more grounded and real. (The post credits scene was directed by Joss Whedon). 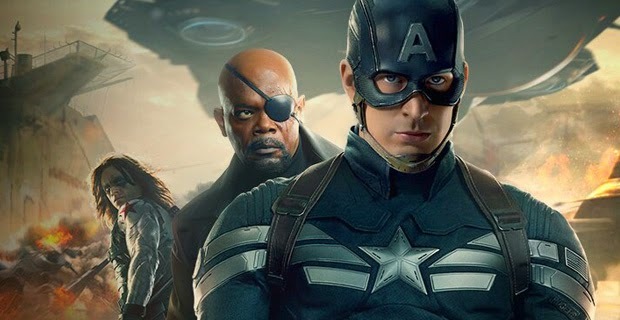 There are many more films coming up this year with Spider Man 2, Godzilla, X-Men, Guardians of the Galaxy and Ninja Turtles, but they will be hard pressed to exceed the excellence of Captain America: Winter's Soldier. Chris Evans is back playing Steve Rodgers/Captain America who is still coming to terms with living in the future. He's taken to writing suggestions of things that he needs to check out in a little notebook. S.H.I.E.L.D. Director Nick Fury (Samuel L. Jackson) introduces Rogers to Operation Insight, which are three Helicarriers that are designed to preemptively eliminate threats. This type of big brother watching scenario doesn't sit well with Rodgers. Life gets complicated when Fury shows up in his apartment all beat up, slipping him a flash drive and telling him not to trust anyone. Fury's boss Alexander Pierce thinks that Rodgers his hiding something by not revealing Fury's last words to him and brands him a fugitive. Suddenly everyone in his agency is trying to kill him. With the help of Natasha/Black Widow (Scarlett Johansson), Sam Wilson/Falcon (Anthony Mackie), and Maria Hill (Cobie Smulders), the Captain attempts to discover what is on the flash drive and fight this new villain, The Winter's Solider (Sebastian Stan), who seems to be just has strong, agile and quick as Captain America. Rodgers discovers that S.H.I.E.L.D. has been infiltrated with HYDRA agents and the Winter's Soldier may be an old friend from the past. There is no loss of action sequences that include Rodgers fighting an elevator full of bad guys, crazy highway mayhem, unlimited creative uses for the Captain's shield. The climatic Helicarrier sequence is satisfying excitement while time to save the day ticks to the last second of redemption. This is a well balanced film, that is moodier than the first film, with touches of humor and some slight political overtones that hopefully remind people that total control is not really a good policy. Hydra's new world order entails tearing down the old world to build a better one in the most excessive manner by destroying millions of people who may be considered a threat. Captain America remains the stalwart symbol of saving the world for sake of freedom. And we are right by him. Oh...stay until after the credits of the extra scene!